First of a pair of trips to the latest venue – Austria. H provided transport to the station for 0757 to BHM – ludicrously early but the 0840 is Arriva’s… It was on time, nicely refurbished (front unit at least) 4-car 170, reinforcing my good impression of London Midland. The CT guys on the ground (who are still there) were always good – it always seemed the management were inept. I don’t know what’s changed, but in general, and so far, LM (this from a GW fan!) is good. Onwards after kicking my heels at BHM for a while, to Birmingham Irrational in a LM 321.With nothing better to do, I decided to go up early (once I’d realised that Ryanair use T2). 10 minutes or so to get through security, but the decision was thoroughly vindicated by the discovery that ‘Spoons have arrived at T2 – airside! Puritan mode had to be deactivated at 1000 to allow me to enjoy a pint of Highgate Telse. That’s Summer Telse, I eventually realised. Ouch. And so to Bratislava on a super punctual Ryanair 737. Left the stand on the dot, queued 12 minutes to go, arrived 10 early, so I had plenty of time for the 1448 bus off the 1440 booked arrival. It pays to have the right change, which luckily I had, as you can’t get a ticket on the bus. The usual Internet research paid off, with a smooth journey to Lamač on buses 61 and 63. In between Internet information, displays on the buses, and clearly marked bus stops there wasn’t much chance to fail! The station could only sell a ticket to Marchegg Gr., The Man telling me to get the onward part from the machine on the train. It cost a mighty SKK18, less than the bus fare to the airport. The two together made about £1. No station buff but a ‘pub’ which sold Stein, Litovel etc. I had Stein, it being local if unexceptional. An itinerant pest was selling terrifying knives from a briefcase but eventually got the message and went away to annoy somebody else. On to Gänserndorf on an Austrian single unit kart [5047 089] – driver was red hot on revenue protection but also very friendly and happy to navigate me through the ticket machine. €3.50 got me to Gänsernforf – would have been nice to do the connection which goes off before, but you do at least join a loop off the main line, so honour was satisfied. Just missed an S-Bahn at Gänserndorf due to ticket machine unfamiliarity, so I had to wait for the 17:39. Nothing for it but to retire to the pub where an amiable enough non-English speaking Turkish guv’nor provided Gösser at €2.80 the half litre which didn’t seem too terrifying as an indication of things to come! So far, friendly but non-English speaking Austrians 2, rest 0. Suitably refreshed, got the next S2 into Wien Süd low level via Floridsdorf – track! Tram O saved me a very hot walk to Hotel Caroline which was modern, spotless and at €50, more than reasonable. HRS rides again. After a wash and brush up during which I discovered all the beer gen was back in Telford, it was back into town on a U1 from Keplerplatz to Karlsplatz and a short walk to the 1516 Brewing Company for two unfiltered lagers (not bad, not outstanding) and pork medallions in pepper sauce with sautées (outstanding). Trooped off to Wien Süd to locate breakfast as the hotel didn’t start until 7. Wasted effort as it turned out, as a major farce ensued due to the non-appearance of the driver, resulting in a 54 minutes late start from a siding on the south side of the east platforms, with 2070 060 reputedly the haulage. A shunt across to our original booked platform 4 followed, arriving there at 08:00. The 2070 disappeared, and we acquired Henschel/GM diesel 2050.04 (works 29791 of 1958). We got away eventually at 08:17 after a brief ‘false start’. 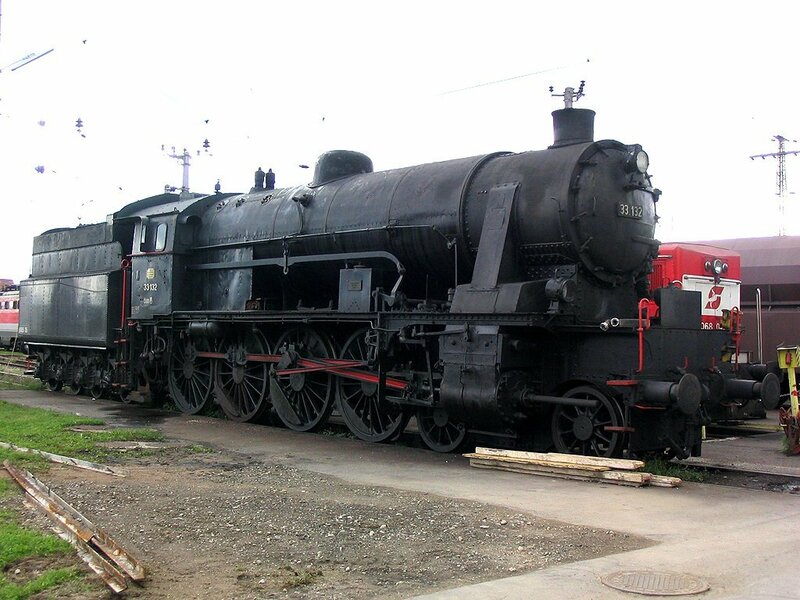 Off to Wien Stadlau without incident, reversing half way up the yard. At Lobau Hafen we stopped at the south end of the yard. 2068 001 provided haulage from Stadlau with 2050.04 on the rear. Further farce at Lobau Hafen, with a wait for an incoming freight, then all the staff and organisers disappearing into the office. Eventually set out from Lobau Hafen after 45 minutes, 97 late half an hour into a 12½ hour tour! Straight up to Stadlau, crossing to the main line at the south end of the yard, then via the Süssenbrunn south to west curve, continuing on the freight line past Wien Leopoldau and crossing to the main line between there and the ‘gasworks’. Through Floridsdorf and Traisengasse then, diverging into Wien Nord yard to reverse on the north side and take the curve round to Wien Donauuferbf. 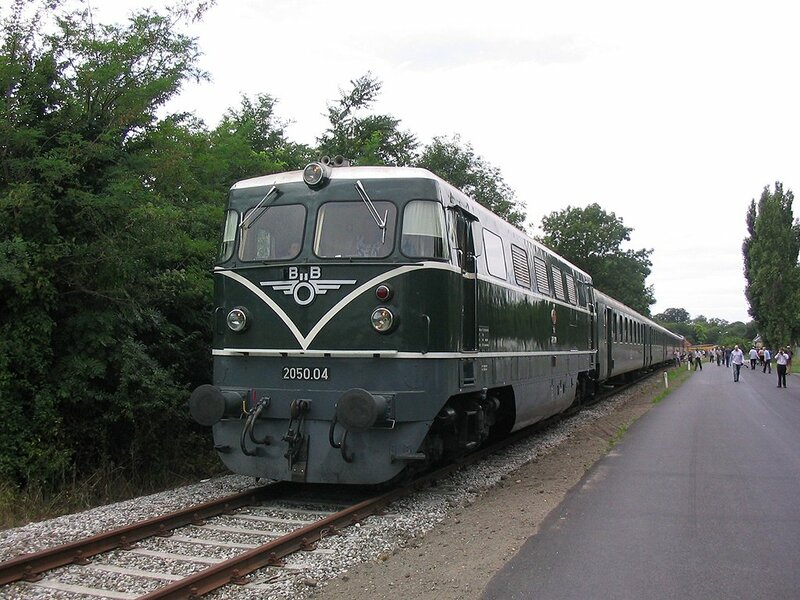 Thence to Donaukaibf, round the curve to Praterkai, through Simmering and down to Zvbf Einfahrgruppe which we passed through adjacent to the passenger lines. We used the west side of Zvbf ‘proper’ continuing to Abzw. Felixdorf then diverging left round to Zvbf Ost, Zvbf Nord and Oberlaa, where we were 73 late. Delayed again for no apparent reason at Maria Lanzendorf, leaving there 87 late. Addition of 2143 052 at the rear and a double reverse kept up the score (aided by several level crossings) and after the phot stop/reversal at Blumau-Neurißhof we left still 83 late. Major recovery then set in, due to some padded timings, and after running up to Leobersdorf and reversing, we left the photo stop at Steinabrückl only 32 late. Who knows what the rest of the day will bring! 25 late from Wöllersdorf, where we reversed to continue to Wiener Neustadt. Slight relapse at Wiener Neustadt with departure at 14:55, 32 late again. It’s a long, long trog down the single line through Aspang to Friedberg and Fehring – timekeeping was still all over the place, eventually arriving at Fehring 26 down but with a 50 minute booked stop. Turned out the stop was for refuelling, which obviously had to be done – the loco rejoined the train spot on scheduled departure time of 18:45. Only a few minutes late departing though and we still have 30 minutes waiting time built in before Graz. On time (!) away from Feldbach after waiting for an eastbound kart; and a minute late from Gleisdorf after waiting for a 2016-shoved Weasel. In the end, after all the delays, we reached Graz Ostbf 8 minutes early… Hon. Organisers had laid on two special trams to take us up to Hbf – these did several extra loops en route (one twice). I baled out once we’d crossed the river and walked down to the Etap, getting thoroughly wet in the process. No harm done though, except that it was too wet to venture out for supper. 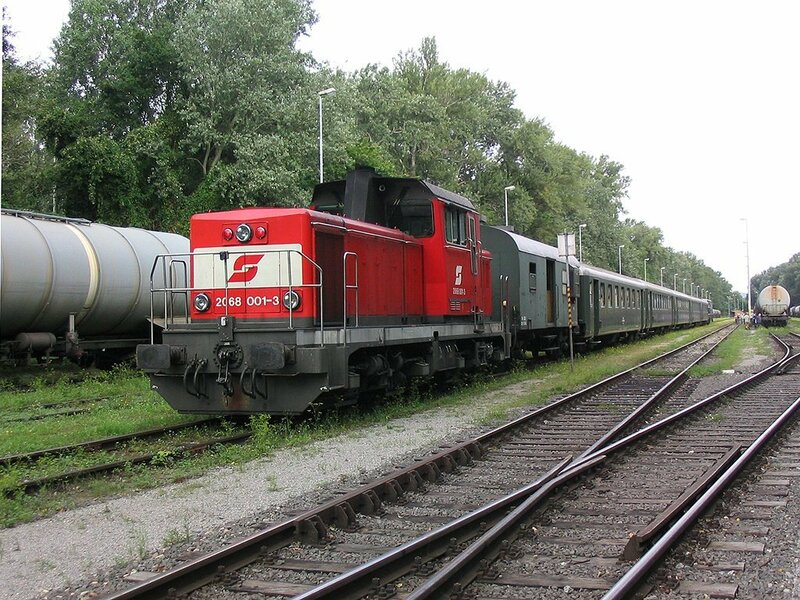 First 'relief' loco for the Friday tour train was 2068 001, seen here at Wien Lobau Hafen. Off betimes for an almost dry walk to the station where breakfast and timetables were to be had. 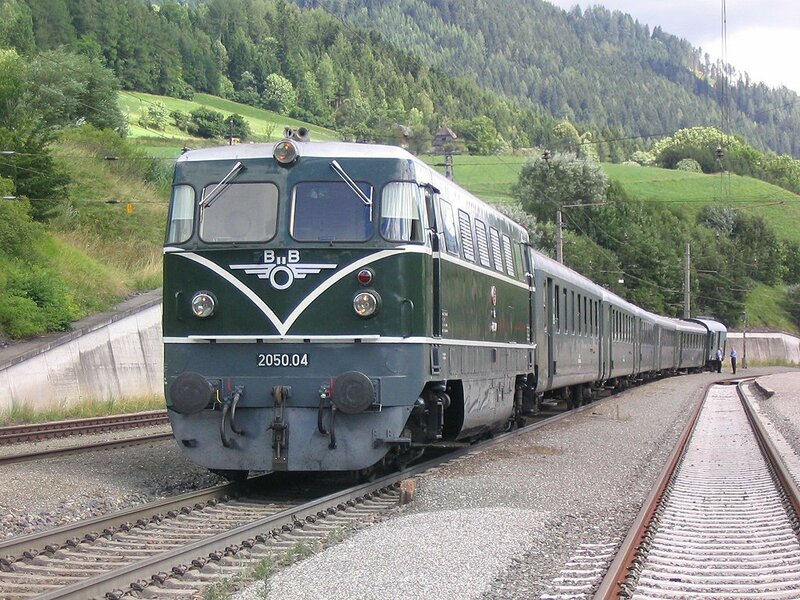 Due to all the weekend molework shenanigans we were supposed to be in two additional coaches on IC653, 0655 Graz-Maribor. On reaching the platform I found the tour train attached at the rear of the IC and was able to occupy the same single seat as yesterday. At Spielfeld-Straß the IC part of the train went forward on its own. ; we acquired SZ’s GM Co-Co 664 102 and departed somewhat late around 0820. A brief stop at Maribor didn’t allow me to set foot in Slovenia but we had a photo stop next to the works at Maribor-Studenci – both locos next to lamp posts unfortunately. Very slow journey to Bleiburg through very attractive scenery in the Drava and Meža valleys. 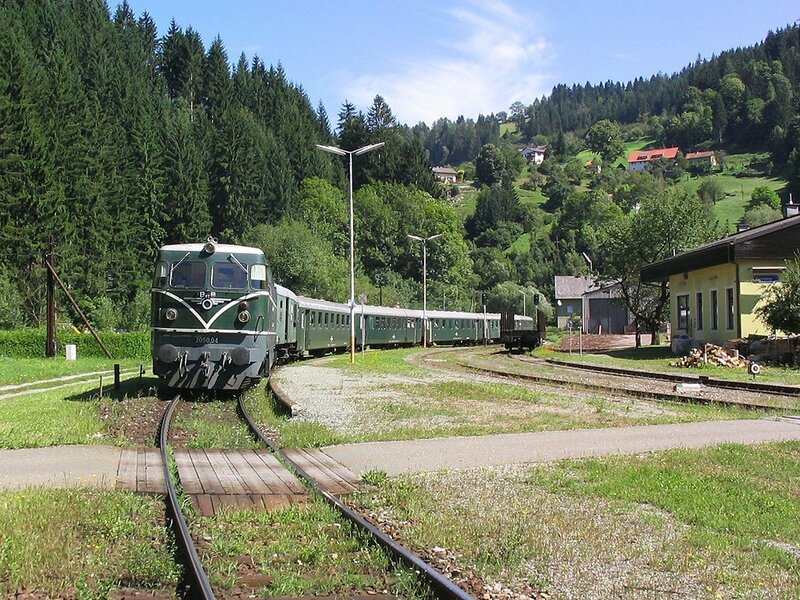 Half an hour late at Bleiburg abd a lot of messing about with locos; as we hadn’t been to Maribor Tezno the 2050 was on the wrong end. Consequently we were 12 minutes late away from Bleiburg but hopefully in time to keep our path to Klagenfurt. Which we did, arriving there a few minutes early. Klagenfurt is thoroughly modernised in the usual DB, oops, ÖBB style. 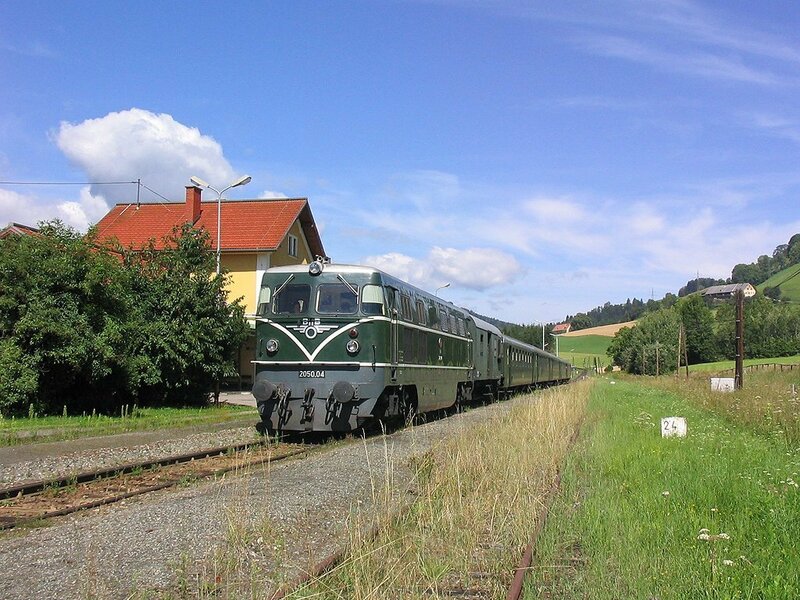 Off up the main line to Zeltweg then, with a particularly well lit photo stop at Scheifling. On time arrival at Zeltweg where 2068 048 was waiting to take us up the Pöls branch as far as the former station but a little way short of the paper mill. The train crew obligingly moved the train back from the lamp posts this time! Very silly, but very good visit to the railway museum at Knittelfeld ensued. The train was taken into the museum site by 2068 048, to be dragged out by 2050.04. The museum itself was very good – English captions would have been useful but even without, there’s a lot to see, even down to a BTP helmet (I didn’t ask). Roast chicken and a bottle of Puntigamer were provided for all – the silly part involved large middle aged Brits riding the 5” gauge miniature railway. Your correspondent managed to resist the temptation, but did have a wander round the ÖBB depot and take lots of phots. The 2050 dragged us out of the depot, then electric 1063 024 (much appreciated by some apparently) took us on to Leoben Hbf, via the new tunnel unfortunately. The pair top and tailed us about a quarter of the way up the Trofaiach branch, only getting as far as the steelworks at Donawitz. Thereafter it was back to Leoben Hbf where we were chucked out to await an Innsbruck-Graz IC at 20:41. This was 5(ish) minutes late and managed to be 10(ish) late at Graz. On the way up to Zeltweg on 9.8.08 the 2050 paused for another photo stop at Scheifling. 08:35 start today as we’d lost most of the worthwhile tour route, so I was able to have a fairly grim Etap breakfast before a warm walk up to the station for the 08:35, IC612 to Leoben (and Innsbruck) which had a non-aircon coach reserved for cranks. Motive power was 1142 612, arrival at Leoben Hbf 8 or so minutes late, at the time the tour train was supposed to depart. Network Rail would probably have sent it on its way, passengers or not… ÖBB didn’t, however, and we left about 10 minutes late. Back to Zeltweg as per last night [tunnel route] then left to go down to St Paul and hopefully Lavamünd. Very steep and picturesque going down to St Paul, it must be said. A reasonably well organised phot stop took place at Reichenfels-St Peter, 2 km or so beyond the summit. Another phot stop at Twimberg, also reasonably well disciplined, then an amount of hanging about at St Paul while the 2050 was changed for a bright blue preserved 0-6-0 diesel. Up to Lavamünd, reached without incident though slowly, with a 5 kph restriction over the Lavant bridge. More shenanigans for phots and ‘bufferstopping’ (actually some parked preserved coaches) with eventual departure 48 late at 13:23. Goulash was served on the way up, most enjoyable, and a previously ordered Ottakringer Helles was waiting on my table when I got back from photting. Civilised railtouring. 65 late from St Paul after letting an ‘all stations to Wolfsberg’ local go in front of us, and all the makings of a fiasco. 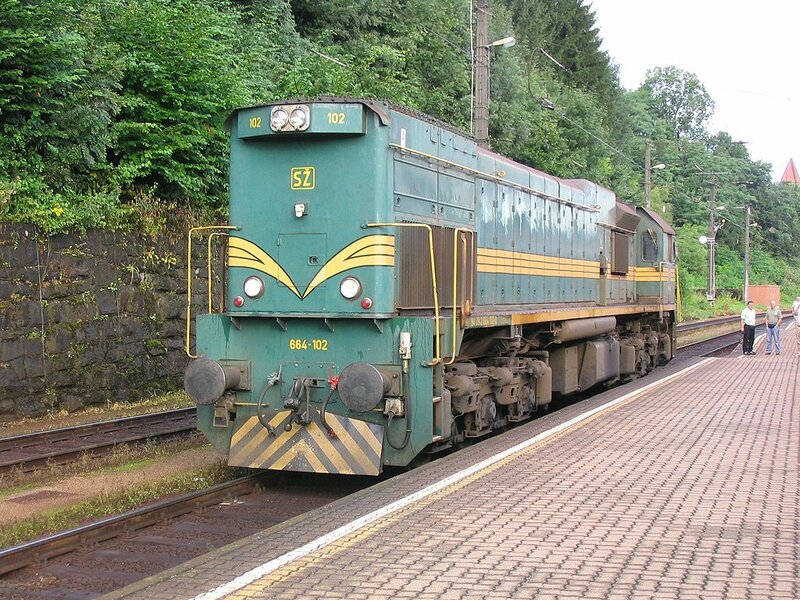 By the time we’d reached Wolfsberg and done two shunts for the buffet to be rewatered we were 80 late; with a few minutes recovered we left Zeltweg 71 down. Good news finally arrived with the information that the Mixnitz Lokalbahn would run only one trip, lasting about an hour. With 2h 20 allowed in the timings that seemed to fit the bill even with our 70 late arrival, and it did. An excellent trip on the Mixnitz line which is a very picturesque valley line, 760 mm gauge, electrified at 800v (presumably DC). And normally freight only to a magnesite (whatever that is) works, with a low key tourist operation. All very efficiently done, complete with photo stop/runpast and a fairly ridiculous short distance ‘haulage’ manoeuvre at Mixnitz for those who needed haulage on electric no 2. I managed (again) to refrain! I did manage a Murauer in the pub opposite the station though, courtesy of a contact with whom I’d exchanged emails a few weeks ago regarding a certain low cost airline. Back on the train a small miracle occurred and we left on the dot at 19:10. Mürzzuschlag was also reached on time at 19:58; we’d been put on the right hand track further west so that a late running IC could pass us on the left hand track just before Mürzzuschlag. ‘Helped’ by a TSR at the bottom of the bank the ancient diesel was fairly slow up the climb to Semmering Tunnel and was overtaken by an electrically hauled freight just before the tunnel. 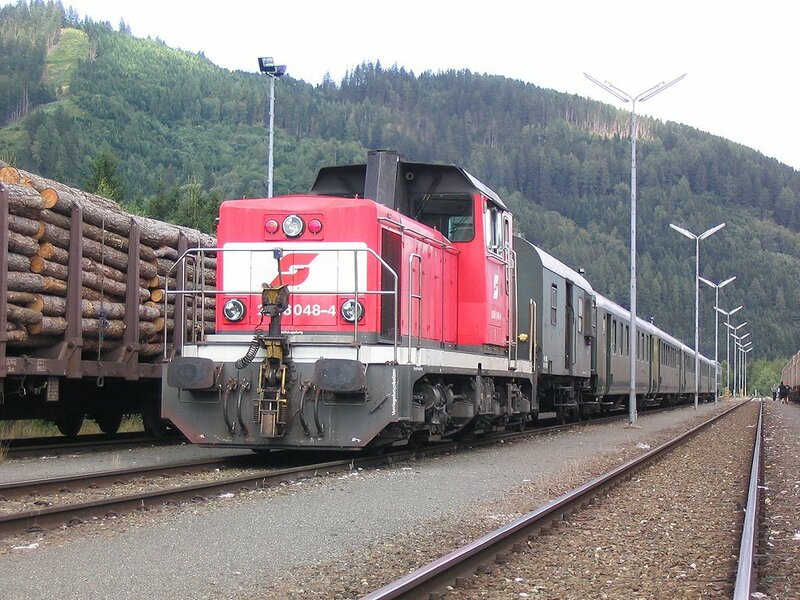 It did have a banker though… justice was done anyway and we passed the freight standing in Semmering station. Sadly daylight was about gone by Breitenstein so I’ll have to hope for good weather when I return as it certainly looks spectacular. Arrived at Gloggnitz for a (booked at least) 30 minute stop – first train to pass us was the freight from Semmering, less its banker. An IC followed, but we were still away 15 minutes early, and 17 minutes early from Wiener-Neustadt Hbf. Although looped for an errant EC from Venezia we were still early at Wien Meidling where I baled out rather than do 2/3 of the Wien Süd avoider in the dark! U6, U4, and U1 had me in a grim, grubby and depressing hotel by 23:00. On Sunday 10.8.08 the tour train paused at Reichenfels-St Peters for a photo stop. A second photo stop was made at Twimberg. Darned lamp posts get everywhere! 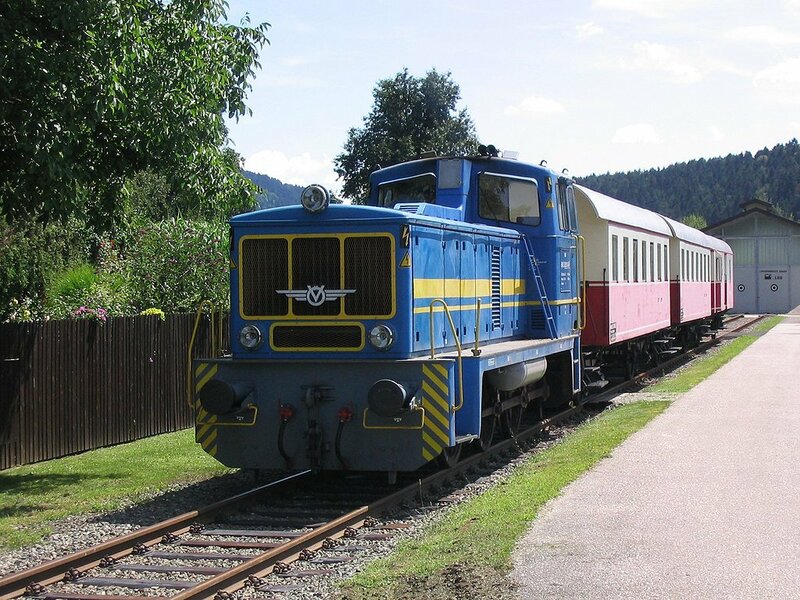 The NBiK loco is seen with two preserved coaches (not used on the tour) at Lavamünd. 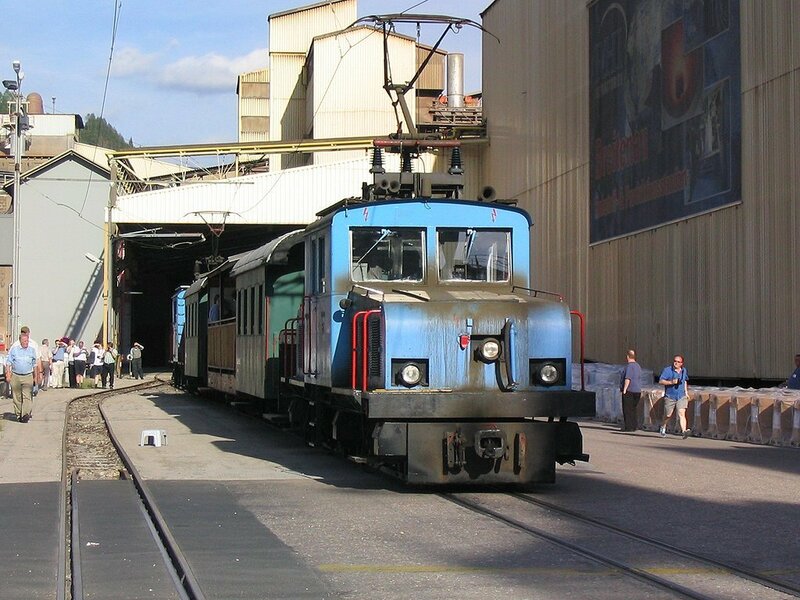 Mixnitz Lokalbahn E3 (with E4 at the other end) on the tour train at the Magnesitwerk Veitsch-Radex near St Erhard, now the end of the Mixnitz Lokalbahn. It was still grim, grubby and depressing in daylight and I had to press for a receipt when I paid (cash only – no receipt? Yeah, right). However there was a perfectly sound standard buffet breakfast for a modest price which was considerably better value than the Etap. Decided to walk up to Südbahnhof rather than wait for a crowded tram – might have been better on the tram as it’s a very warm morning. The ticket machine delivered a ticket to Bratislava happily enough and I joined the mostly double deck (one single at the front) 08:12 REX to Bratislava Petrzalka. The 5 minute booked stop at Gramatneusiedl turned out to be there to let an EC to Budapest pass; that was on time (in fact I thought I saw it waiting on the Wien Süd avoider) and my REX was never more than a minute behind time. On time at Bratislava-Petržalka where I had to find a helpful tobacconist lady to tell me where the 93 bus stop is (through the subway beyond P2 – no signs whatsoever, even in Slovak). Traffic into Bratislava was horrific and the 9:30 bus, due at hlavná stanica at 9:43, missed the 9:45 airport bus by a handsome margin. Next up was the 10:05 which was my ‘last sensible’ option – also stuck in traffic (and wedged as far as Ikea) it was about 10 late at the airport (booked 10:26). My 60 minute ticket had expired by then in theory but that was hardly my problem! Still plenty of time for my flight and Sky Europe had me checked in in about 30 seconds. It was pretty much sweltering by now and I was more than grateful for the Corgon grabbed at the station between buses. The Staropramen at the airport was a temptation but the thought of the ‘facilities’ on a 737 (what size cat did you want to swing, sir?) soon killed that idea! Comfortable and punctual flight with Sky Europe – the 737 left BTS on time to the second and arrived at BHX sufficiently early (13:30 booked) for me to suffer a bus ride to the terminal, huge immigration queue, and still see the 1337 BHI – Walsall leave on time. Unfortunately, I saw it from the Rail-Air funicular! I caught 1350 BHI-BHM, an LM Desiro which arrived just early enough for me to hurtle across to P3b for the 14:07 323 to Wolves. I ended up, after a call at the Great Western, on the 15:15 Wolves – Telford. The second half of my celebratory visit to Austria took place two weeks later, this time flying to the right country!